Benchmark indices recovered more than half of its opening losses, driven by technology, oil stocks and Tata Motors. 3:30 pm Market Closing: Benchmark indices closed sharply lower on Monday as the Sensex was down 309.59 points or 0.88 percent at 34,757.16, and the Nifty fell 94.10 points or 0.87 percent to 10,666.50, dragged by private banking & financials. 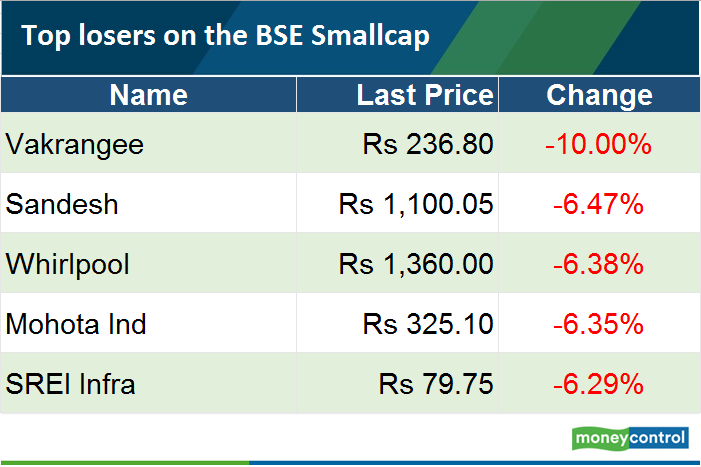 About 1,653 shares declined against 1,140 advancing shares on the BSE. 3:28 pm Earnings: Bosch shares gained 2.5 percent despite lower-than-expected earnings in Q3. Profit growth of 30.8 percent at Rs 281 crore was below analyst expectations of Rs 321 crore while revenue grew by 14.1 percent YoY to Rs 3,071.9 crore for the quarter ended December 2017. Operating profit growth of 55.7 percent at Rs 447.6 crore and margin expansion of 390 basis points at 14.6 percent were also lower than CNBC-TV18 poll of Rs 470 crore and 15.5 percent, respectively. Tax expenses doubled to Rs 152.8 crore from Rs 75.2 crore YoY. 3:20 pm Buzzing: Shares of Brooks Laboratories gained 5.7 percent intraday as the company received certificate for good manufacturing practice. The company share recovered percent 12.5 from the intraday low and 52-week low of Rs 91.50. The company's Vadodara facility has received good manufacturing practice certificate from EU Regulator. 3:14 pm Market Update: Benchmark indices continue to trade lower amid volatility in late trade, with the Sensex falling 327.60 points or 0.93 percent at 34,739.15 and the Nifty declining 98.10 points or 0.91 percent at 10,662.50. 3:05 pm Buyback: HEG informed exchanges that a meeting of the board of directors is scheduled to be held on February 8 to consider either the payment of interim dividend, if any, or proposal for the buy back of equity shares. The record date for determining the entitlement of the shareholders for the payment of interim dividend will be February 16. 2:55 pm Sugar import duty: The food ministry has proposed doubling of the import duty on sugar to 100 percent to curb cheaper imports, check falling wholesale prices of sweetener and ensure timely payment to cane farmers, sources said. Wholesale prices have fallen below the cost of production in view of estimated 6 million tonnes more production in the 2017-18 season (October-September). In retail market, sugar is being sold at Rs 40-42/kg. According to the sources, a recommendation has been made to the finance ministry that import duty on sugar be raised from the current 50 percent to 100 percent to protect domestic sugarcane farmers. A notification in this regard may be issued soon, they said. 2:50 pm Europe Trade: European stocks traded sharply lower as weakness seen in markets overseas weighs on sentiment. The pan-European Stoxx 600 was more than 1 percent lower with every sector trading in negative territory. Global markets fell across the board after the Dow Jones industrial average tumbled 665.75 points to close down at 25,520.96 on Friday, capping off the index's sixth-largest points decline ever. 2:44 pm Buzzing: Dredging Corporation gained 5 percent after CNBC-TV18 reports quoting NewsRise that Ministry of Shipping would sell government's shareholding in the company via 2-stage auction. 2:34 pm Earnings: Colgate Palmolive has reported healthy growth in third quarter earnings which were ahead of analyst estimates on Monday. Profit grew by a whopping 33.5 percent year-on-year, with flat volume growth of 12 percent for the quarter ended December 2017. It was low base driven growth as earnings in Q3FY17 were impacted due to demonetisation. Revenue from operations during the quarter grew by 18.2 percent to Rs 1,033.3 crore compared to Rs 874.6 crore in corresponding quarter of last fiscal. Operating profit growth of 32 percent at Rs 282.4 crore and margin expansion of 280 basis points at 27.3 percent were ahead of CNBC-TV18 poll of Rs 264 crore and 25.7 percent, respectively. 2:23 pm Distribution Agreement: Escorts Construction Equipment division announced entering into an exclusive distribution agreement with Doosan Infracore Co. Limited, South Korea for exclusive distributorship for sale and service of Doosan products for the entire Indian Market. Doosan is a global leader in manufacturing and marketing of Crawler excavators, mini excavators and wheel loaders. 2:16 pm IPO: Private healthcare service provider Aster DM Healthcare will be opening its initial public offering for subscription on February 12, with a price band of Rs 180-190 per share. The IPO consists of a fresh issue of up to Rs 725 crore and an offer for sale of up to 1,34,28,251 equity shares by the promoter, Union Investments Private Limited. The issue will close on February 15. The fresh issue proceeds will be utilised towards repayment and/or pre-payment of debt; purchase of medical equipment; and general corporate purposes. 2:05 pm Buzzing: Westlife Development shares gained more than 3 percent as profit for December quarter stood at Rs 7.7 crore against loss of Rs 1.7 crore in previous year. Revenue grew by 27.6 percent to Rs 303.7 crore and operating profit increased 5.2 percent to Rs 33.7 crore but margin contracted 240 basis points to 11.1 percent compared to year-ago quarter. 1:57 pm Earnings: Eveready Industries India today reported 40.49 percent decline in net profit at Rs 20.94 crore for the quarter ended December 31, mainly on account of higher expenses. Total income during the quarter under review stood at Rs 373.80 crore. It was Rs 346.90 crore in the December quarter of 2016-17. The company said revenue for the period is not comparable on account of implementation of GST from July 1, 2017. Expenses during the quarter were Rs 347.06 crore as against Rs 318.34 crore in the same period previous fiscal. The stock was trading 5.60 percent down at Rs 375 apiece on BSE. 1:48 pm Market Update: The market extended losses in afternoon, with the Sensex and Nifty Bank indices falling around 400 points each. Vakrangee was locked at 10 percent lower circuit despite clarification from the management, saying it has not received any communication from Sebi with respect to stock price manipulation. United Breweries was the top F&O gainer, rising 2 percent after the company reports strong Qq earnings. Management said that they believe worst is behind for the company and that the industry growing currently at 10 percent. Tata Motors gained 2.5 percent ahead of earnings later today. A CNBC-TV18 poll expects consolidated revenue growth of 19 percent and 5-fold increase in profit YoY. 1:40 pm Policy rates expectations: After Budget 2018, all eyes are on RBI monetary policy scheduled to be released on February 7. Economists largely expect the status quo on policy rates but the commentary would be key key to watch out for. According to majority of economists, RBI may start hinting about rate hike in forthcoming policies given likely tightening interest rate cycle globally. "We continue to expect the RBI to persist with its slightly hawkish pause in its Wednesday policy, from February, to err on the side of caution," Bank of America Merrill Lynch said in its research note. "That said, falling onion prices, after tomatoes, support our call that inflation risks are overdone," it added. In fact, the government has reportedly removed the USD 700/t minimum export price for onions. Inflation is likely peaking off to 5 percent in January from 5.2 percent in December with the vegetable price spike expectedly reversing, according to the research house. 1:27 pm Market Check: Benchmark indices continued to trade lower in afternoon, with the Sensex falling 324.90 points or 0.93 percent to 34,741.85 and the Nifty down 96 points or 0.89 percent at 10,664.60. The market breadth recovered further as about two shares declined for every share rising against 9:1 in early trade. HDFC was the biggest loser, falling 4 percent followed by HDFC Bank, L&T, TCS, ICICI Bank, IndusInd Bank, Kotak Mahindra Bank, Vedanta and Adani Ports which declined 1-3 percent. Bharti Airtel rallied more than 4 percent, followed by ITC, Tata Motors, HPCL, Power Grid, Bharti Infratel and Hero MotoCorp which gained 1-3 percent. 1:20 pm Buzzing: Vakrangee continued to trade lower for sixth consecutive day today despite clarification from the management on stock price manipulation. The stock shed more than 53 percent in six straight sessions. "We have not received any communication either from stock exchange or Securities and Exchange Board of India. The rumours of involvement of company in price and volume inflation is completely baseless and factually not correct," Dinesh Nandwana, MD & CEO, Vakrangee said. He further said, "Before any tie-up, we do the soft pilot and post successful pilot we do the formal agreement. So, in the case of PC Jeweller we had a soft pilot in the certain outlets and then we do a soft testing in all the outlets. After successful soft pilot we do formal agreement. When we start the soft tie-up we have to put their logo in the outlet also, not only the presentation. Till now we have not gone to have a formal agreement so we removed the logo,"
1:14 pm Earnings: Kalyani Steels shares fell more than 2 percent after its Q3 net profit declined 10.2 percent year-on-year to Rs 30.8 crore and revenue slipped 2.7 percent to Rs 337.1 crore. Operating profit also declined 25.8 percent to Rs 49.3 crore and margin contracted 460 basis points to 14.6 percent compared to year-ago. 1:05 pm Buzzing: Tata Motors shares gained 3.5 percent intraday ahead of company's third quarter earnings later today. Healthy operational growth at JLR and domestic business may drive profit higher by 5-fold. The passenger and commercial vehicle maker is expected to report consolidated profit at Rs 3,040 crore for December quarter against Rs 625 crore in year-ago, according to average of estimates of analysts polled by CNBC-TV18. UK-based luxury car maker Jaguar Land Rover is expected to report double growth in profit at 308 million pound, with operating income rising sharply by 38.6 percent year-on-year and margin expansion of 280 basis points. Standalone (domestic business) net loss is expected to be at Rs 7 crore for the quarter, down from Rs 1,012 crore in year-ago due to improvement in operational performance and higher revenue post strong commercial volume growth in Q3. 1:00 pm Europe likely to fall at open: European stocks are expected to post heavy losses at open, as weakness seen in markets overseas weighs on sentiment. The FTSE 100 is expected to start 78 points lower at 7,364; while the DAX is seen falling 150 points at 12,634 and the CAC 40 is set to open 63 points lower at 5,305, according to IG. In peripheral markets, Italy's FTSE MIB is set to fall 237 points, at 22,958. 12:54 pm Earnings Reaction: Vardhman Acrylics shares rallied 14 percent on NSE after profit more than doubled to Rs 15 crore in Q3 from Rs 6.1 crore in previous year. Revenue during the quarter increased 28.5 percent to Rs 90.8 crore YoY while operating profit grew by 91.5 percent to Rs 18.6 crore and margin expanded by 670 basis points to 20.5 percent compared to year-ago. 12:42 pm Delisting: Polaris Consulting's delisting offer will end today. More than 1.56 crore shares tendered at or below Rs 480 per share, CNBC-TV18 report said. The stock rallied more than 8 percent. 12:29 pm Market Update: The benchmark BSE Sensex dropped by 263 points in afternoon trade as investor sentiment weighed down by a sell off in global markets. The 30-share BSE Sensex was down 263.20 points or 0.75 percent at 34,803.55 and the 50-share NSE Nifty fell 81.60 points or 0.76 percent to 10,679.00. Meanwhile, to soothe investors' nerves, the government said that the sell-off in local stocks has been triggered by weak global cues and not by the long term capital gains tax imposed from February 1 onwards. 12:20 pm Management Interview: Cummins India posted a weak set of earnings in Q3 as poor exports and lower margins impact results. In an interview to CNBC-TV18, Rajiv Batra, CFO said that the company is seeing no progress in capital investment cycle. He further said that power generation revival may be two-three quarters away. Industrial market is doing well; we saw sequential growth of over 23 percent, he added. Cummins is seeing tailwinds from government spend in industrial segment, said Batra. "We expect 15-20 percent growth in FY18 in industrial segment and we will see 5-10 percent domestic growth in FY19." 12:11 pm Poll: Ujjivan Financial Services' third quarter (October-December) profit is expected to fall sharply by 36.7 percent YoY but sequentially there could be improvement from loss of Rs 12 crore in Q2FY18. Profit is expected to be at Rs 27.8 crore in Q3FY18 against Rs 43.9 crore in previous year, according to average of estimates of analysts polled by CNBC-TV18. Net interest income, the difference between interest earned and interest expended, may fall 3.5 percent year-on-year to Rs 192.5 crore in Q3 but sequentially may increase 17 percent. 12:00 pm Oil Update: Oil prices extended declines from the end of last week on the back of a stronger dollar, with Brent crude falling to its lowest in nearly a month. Other markets dropped as investors were spooked by Friday's US payrolls report which showed wages growing at their fastest pace in more than 8-1/2 years, fueling inflation expectations. That drove the greenback higher, which puts pressure on oil as the commodity is priced in dollars. Brent was down 64 cents, or 0.93 percent, at USD 67.94 a barrel, after falling 1.5 percent on Friday. US West Texas Intermediate (WTI) crude declined 52 cents or 0.79 percent to USD 64.93, after dropping 0.5 percent in the previous session. 11:50 am Earnings Estimates: Colgate Palmolive is expected to report good numbers for October-December quarter given low base due to demonetisation, demand recovery, increased rural penetration and new launches. Apart from volume growth & toothpaste market share, other key thing to watch out for would be whether the king of toothpastes can deliver a surprise or not? Profit during the quarter is expected to grow by 25 percent year-on-year to Rs 160 crore and revenue from operations (excise adjusted) to increase 17.5 percent to Rs 1,027 crore, according to average of estimates of analysts polled by CNBC-TV18. Operating profit may jump 23.5 percent to Rs 264 crore and margin may expand 120 basis points to 25.7 percent compared to year-ago. Analysts expect volume growth at around 12-15 percent. Colgate launched Cibaca Vedshakti in the naturals space to compete with Patanjali & Dabur India. Analysts expect around 35-40 percent increase in advertising spends. 11:42 am Market Update: Benchmark indices continued to trade lower but were off day's low. The Sensex fell around 300 points and the Nifty continued to hold 10,650 levels. Market breadth improved though it was still weak. About three shares declined for every share rising against 9:1 in early trade. PC Jeweller was the most active stock on exchanges, trading 13 percent higher today against 24 percent loss amid Friday's turmoil. 11:28 am Poll: Passenger and commercial vehicle maker Tata Motors is expected to report 5-fold jump in its consolidated profit for the quarter ended December 2017 due to JLR numbers and reduced losses in domestic business. Consolidated profit is seen rising to Rs 3,040 crore for December quarter from Rs 625 crore in year-ago, according to average of estimates of analysts polled by CNBC-TV18. Revenue from operations may increase 19.4 percent year-on-year to Rs 76,383 crore compared to Rs 63,933 crore, the poll said. Operating profit is expected to rise 59 percent to Rs 9,964 crore and margin may expand 320 basis points to 13 percent compared to previous year. 11:20 am Govt's explains LTCG imposition: As stock prices continued to take a beating, the government today gave detailed reasons for taxing long-term capital gains made out of selling shares, saying exempting such income from tax was inherently biased against manufacturing and encouraged diversion of investment to financial assets. In Frequently Asked Questions (FAQs), it said the Budget for 2018-19 provides for taxing Rs 1 lakh and above of Long Term Capital Gains arising from sale of shares held for over one year at a concessional rate of 10 percent. Prior to this, long-term capital gains arising from transfer of long term capital assets, being equity shares of a company or a unit of equity oriented fund or a unit of business trust, was exempt from income-tax under clause (38) of section 10 of the Act. 11:10 am Moody's on fiscal deficit: The Budget for 2018-19 strikes a balance between fiscal prudence and growth, and a "slight" slippage in fiscal deficit has no material impact on overall economic strength. The government has revised its 2018-19 fiscal deficit projections to 3.3 percent of GDP and for the current fiscal to 3.5 percent of GDP, against original targets of 3 percent and 3.2 percent, respectively. The medium-term target to reduce the central government debt-to-GDP ratio to 40 per cent is supportive of the sovereign credit profile, Foster said. 11:00 am GMR Airport to acquire stake in GHIAL: Shares of GMR Infrastructure added more than 3 percent intraday as the company is going to acquire 11 percent stake in GMR Hyderabad International Airport. GMR Airports, a subsidiary of GMR Infrastructure has entered into an agreement to acquire 4,15,80,000 shares of face value Rs 10 each, representing 11 percent equity stake in GMR Hyderabad International Airport (GHIAL) collectively from Malaysia Airports Holdings Berhard (MAHB) and its subsidiary MAHB (Mauritius). The said acquisition is subject to standard approvals and total consideration for same is approximately Rs 484 crore (USD 76 million). 10:50 am Market Update: Frontline as well as broader indices were off their opening lows due to short covering. 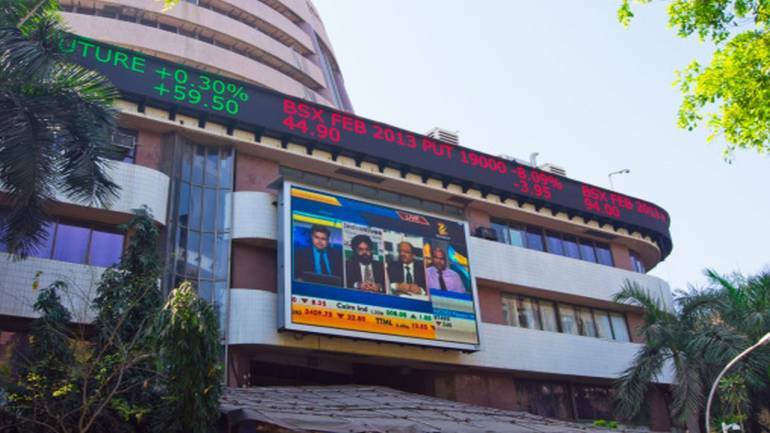 The 30-share BSE Sensex was down 348.96 points or 1.00 percent at 34,717.79 and the 50-share NSE Nifty fell 106.70 points or 0.99 percent to 10,653.90. 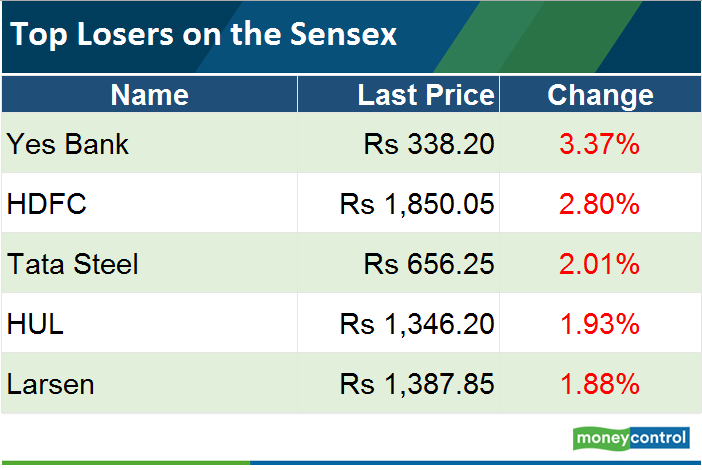 All sectoral indices were in the red but were off day's lows. Bharti Airtel was the top gainer among Nifty 50 stocks, rising 3.5 percent as Singtel will invest Rs 2,649 crore in promoter company, Bharti Telecom via preferential issue. 10:40 am Rupee Update: The rupee depreciated by 3 paise to 64.09 against the US dollar in morning at the interbank forex market today amid sharp losses in equity markets. A currency trader said increased demand for the US currency from importers and banks and persistent losses in domestic equity markets weighed on the rupee. On Friday, the rupee weakened by 4 paise to 64.06 a dollar as forex traders appeared cautious in view of upward revision of fiscal deficit target and the net borrowing for the current fiscal in the Union Budget. 10:30 am Services PMI: The Indian service sector remained in expansion mode in January, driven by a renewed increase in new business, Nikkei IHS Markit said. Growth rates for activity and employment accelerated since December, but remained weaker than their respective long-run survey averages. Having been the strongest in four years in November, input price inflation stabilised at a relatively weak level in January, while businesses increased their charges at a slightly faster rate, it added. 10:20 am Results today: Tata Motors, Colgate Palmolive, Ujjivan Financial Services, Bosch, Ador Welding, Alkyl Amines, Astrazeneca Pharma, Century Plyboards, Cochin Shipyard, BASF, Cosmo Films, ENIL, Eveready Industries, Greaves Cotton, HUDCO, IFCI, Igarashi Motors, JSW Holding, Kalyani Steels, MM Forgings, Mcleod Russel, Mold-Tek Packaging, Omkar Specialty chemicals, Panama Petrochem, Sheela Foam, Timken, Themis Medicare, Tribhovandas Bhimji Zaveri, Usha Martin, Weizmann Forex and Westlife Development will announce earnings today. 10:10 am Market Update: Benchmark indices recovered more than half of its opening losses, driven by technology, oil stocks and Tata Motors. The recovery was on expected lines as the Sensex shed more than 1,300 points from Friday session. The 30-share BSE Sensex was down 240.70 points or 0.69 percent at 34,826.05 and the 50-share NSE Nifty fell 76 points or 0.71 percent to 10,684.60. 9:55 am Market Outlook: Bharat Iyer of JP Morgan, personally, feels the Nifty could be bottomed out at 10,000-10,300 levels and the next month could be challenging for India as well as globe. It meant the market can fall further from here on, though the intermittent recovery could be possible as Iyer feels the current fall is definitely a buying opportunity for investors who missed the bus earlier. Broader markets have been hitting hard but that does not mean the end of bull market, he said, adding we are getting into matured phase of bull market. Valuations definitely picked up in last six months on easy monetary policy and pick up in economic growth, but earnings will have to do tough jobs to prove valuations, Iyer said. 9:46 am Buzzing: Tata Motors is trading near day's high ahead of Q3 earnings later today, rising 1.5 percent. A CNBC-TV18 poll expects nearly 5 times jump in Q3 consolidated profit. 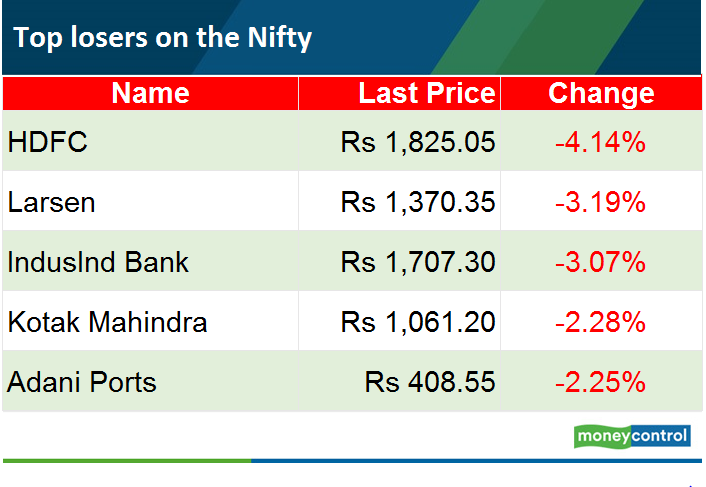 9:38 am Market Check: Benchmark indices continued to trade sharply lower, though recovered a bit from opening lows. About nine shares declined for every share rising on the BSE. TCS, Infosys, Tata Motors, Bharti Airtel, ITC, Tech Mahindra, Wipro and HCL Technologies were gainers. 9:35 am Buzzing: Shares of Inox Wind, PI Industries and Gujarat Gas declined 3-10 percent in morning on the back of poor Q3 (Oct-Dec) numbers. Inox Wind has registered net loss of Rs 46 crore in Q3FY18 against profit of Rs 107 crore. Revenue of the company was down 92 percent at Rs 90 crore. The company post operating loss at Rs 18.6 crore versus profit of Rs 183.4 crore. PI Industries' Q3FY18 net profit was down 14 percent at Rs 80 crore, while revenue was up 7 percent at Rs 537 crore. The operating profit (EBITDA) was up 1 percent at Rs 104 crore and margin was down 170 bps at 19.4 percent. Gujarat Gas has posted 2 percent declined in its Q3FY18 net profit at Rs 60 crore, while, revenue was up 13 percent at Rs 1,614 crore. EBITDA was down 2 percent at Rs 198 crore and margin was down 190 bps at 12.3 percent. 9:25 am Investment: Bharti Airtel said Singtel would invest Rs 2,649 crore in promoter company, Bharti Telecom via preferential issue. Funds raised will be used towards debt reduction, it added. Singtel's stake in Bharti Telecom will increase to 48.9 percent from 47.2 percent. 9:20 am Buzzing: PC Jeweller rallied more than 20 percent in early trade on huge buying, after the stock hit hard in previous session. On Friday, the stock fell close to 60 percent intraday but recovered later to close with a loss of 24.40 percent post management positive comments and clarified on relation with Vakrangee that has been facing some issues. 9:15 am Market Check: Benchmark indices opened the week sharply lower on Monday, with the Sensex falling more than 500 points, tracking weakness across the globe. The 30-share BSE Sensex was down 527.75 points or 1.50 percent at 34,539 and the 50-share NSE Nifty fell 166.40 points or 1.55 percent to 10,594.20. Vakrangee, Inox Wind, HCC, IFCI, Westlife Development, Union Bank of India, Gujarat Gas, Future Consumer and Jain Irrigation were down 2-10 percent.